Soak cedar planks in water for about 1-2 hours ahead of time. In a shallow dish, combine onion, ginger, cilantro and barbecue sauce. Place salmon filets into sauce mix and marinate for 30 minutes. 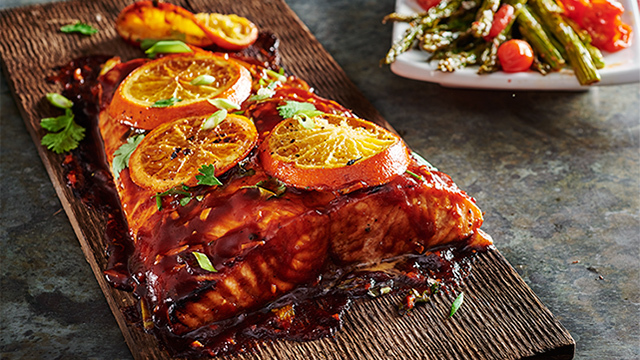 Place salmon filets onto cedar planks and drizzle marinade over top. Top each salmon filet with 3 orange slices. Cook salmon for approximately 20 minutes or until internal temperature is 145°F. Sprinkle cilantro over top of salmon before serving.